Virginia Fitch has a big family, but the elderly resident of an assisted living facility added two “great grandchildren” to her photo shelf this year—thanks to an inspired teacher’s class project. 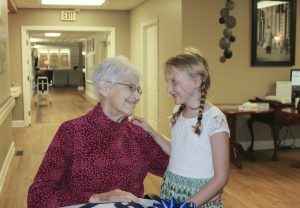 Fitch and 12 other seniors who live in Countryside Manor in Jackson were partnered with “buddies” from the second-grade class of teacher Jennifer Zeller. The youngsters traveled from their Michigan Center school several times during the year in Zeller’s richly layered project. “I wanted my kids to unplug from electronic devices and slow down, to learn about the value of stories and passing on legacies,” Zeller said. Another motivation was her own father, who suffered a series of health problems and moved into Countryside in 2015. She knew students had traveled to senior living facilities to present music programs in the past, and she wondered, What if I could do something more? Zeller’s inspiration became reality when her grant proposal secured funding for a bus. Before the first visit with their buddies, the students discussed the friends they were about to meet by reading a picture book, Wilfrid Gordon McDonald Partridge, by Mem Fox. It tells the story of a boy who helps an elderly friend to regain some of her memory. The seven-year-olds had to practice carrying conversations if the other person couldn’t hear perfectly or didn’t remember what was said. Two students were paired with each elderly buddy. Eventually, they recorded interviews on iPads. They researched unfamiliar historical terms, such as hoop stick, zeppelin, and washboard. And they produced hand-written illustrated books describing their buddies—authentic writing for an audience that elicited emotional reactions.